Appadmin is a very peculiar tool thanks to which you'll be able to block certain applications on your computer so that nobody can access them, not even by using Gpedit.msc. This is very practical, for example, to avoid other people from accessing programs that may contain personal information. It will also come in very handy for those applications that are rather complex to handle and that can alter the proper functioning of our computer if they are not used properly. 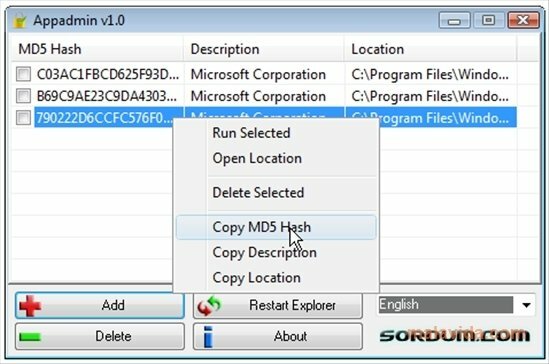 How this lightweight portable program works is very simple, because you will only have to drag and drop the applications that you want to protect on to the application's interface or select them with the “Add” options. After you have done this, you will have to press “Restart Explorer”. 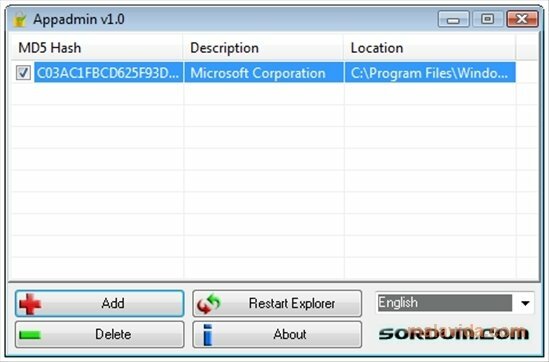 If it comes the case that you have to eliminate one or more of the restrictions, all you will have to do is click on “Delete” and restart the Explorer once again. Thanks to Appadmin you can protect your PC avoiding that the rest of users access those applications that you don't want them to.